Holy cow! Could I have any more projects to do at once?! Well, probably, but man I’ve got a lot to do! I started off with my dining room because not having a place to eat gets REALLY old, REALLY fast! The walls were an apple green color when we moved in but I was looking for something neutral so I painted over it with Oriental Silk from Home Depot. I got this table and chairs for $50 from an old college in the area that is being torn down… it’s an old not so pretty simple table and 4 matching chairs. 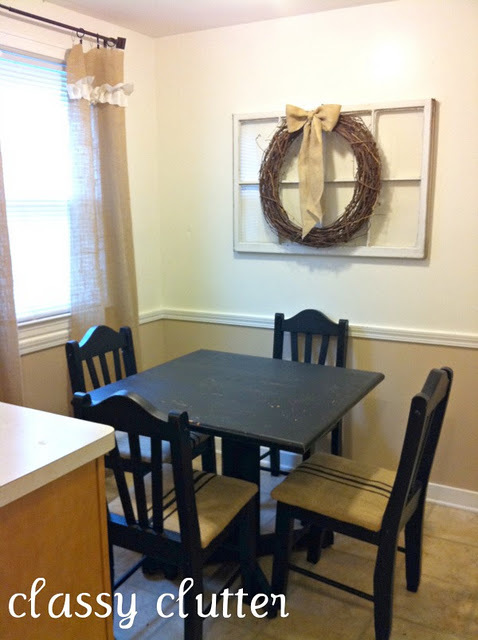 Nothing fancy to it at all but I have lots planned for the dining room wall so I didn’t want something too fancy. WHOA! BEFORE I FORGET…. who? what? when did this stuff get on the shelves?? Paint & primer in one SPRAY!!!! Krylon, you rock! I bought 6 cans and ended up only using 3 1/2! Awesomeness!!! I was able to return the other cans which was nice because I needed paint for my headboard that I’m working on! I LOOOOOOVE IT! This is what I used on my table. All I did was wipe it down really good with 409 and gave it two or so coats of Krylon’s Dual in Black Satin. Then, I recovered the chairs cushions… they were bad. Really bad. Have you recovered cushions before?? SOOOO easy! I have a tutorial coming soon for you on that just in case you aren’t sure what to do! This was my 4th set of dining room chairs that I’ve recovered so I’ve learned a few tricks along the way! 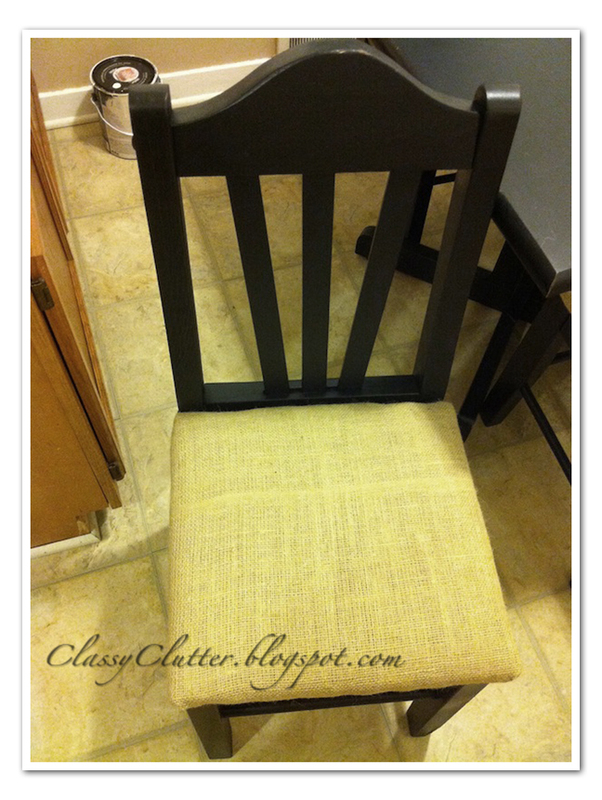 Update: See how I added stripes to the seat cushions here. LOTS more to do to make this my home! I am so thankful that I have good bones to work with! The house is super cute but needs my own personal touch to make it home ya know? Yay for your 1st project in your new place. I love it I bet you are so proud! You should show more of your home so we can see the befores and afters lol. Have a good rest of the week.